Eco-friendly villa for rent in Balchik, Bulgaria. 4-bedrooms and private pool! Promotions: 20 % discount for all bookings in May, June and September; 10 % discount for last minute bookings (3 weeks prior to arrival) for July and August; for clients who book min 3 weeks or more. SPECIAL 20% DISCOUNT AVAILABLE FOR MAY, JUNE AND SEPTEMBER 2019! Villa Lilly is a brand new holiday home, built in 2007 to meet all family requirements for a perfect vacation close to the Black Sea shore. The villa is located in a quiet area between Albena resort and Balchik town, distanced about 2 km from the beach, its modern living facilities to ensure the high standard for the villa’s guests and the charming environment of the surroundings. With its more than 250 sq. m. living area, the villa is the perfect summer holiday home for your family vacation in Bulgaria. Equipped with all children facilities – children swimming pool, high chair, baby cot - guests will enjoy an easy-going vacation. 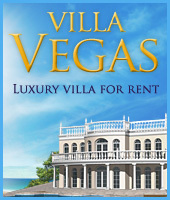 The full and friendly support by the Villa Manager will contribute additionally to your carefree holiday in Bulgaria. The villa’s entrance opens onto the first floor, where you will find 3 bedrooms – all of them en-suite and with a small balcony each, where the guests would enjoy the sunrise or the sunset over the villa. On this floor one of the bedrooms is equipped with a double bed, while the other two are with 2 single beds each, which can be put together or separate in accordance with your preferences. Further bedroom furniture includes a wardrobe, dresser with mirror, bedside tables with reading lamp. The first floor bathrooms are fitted with a bath tube, WC, basin with mirror. Internal staircase leads to the ground floor, which comprises of a wide living room (about 70 sq.m.) with lounge area with 5 seats and tea table in front of the Plasma TV; coffee and tea sitting area with 4 seats and small table for hearty talks; open-plan kitchen area with enclosed dining table with 8 seats and a separate shower-room with WC and a washing machine. Kitchen is fully equipped with: dishwasher, 4 electric hobs, oven, microwave oven, coffee machine, toaster, el. kettle, extractor, refrigerator combined with a freezer. Separately, on the ground floor there is a en-suite double bedroom located. The enclosed shower-room is fitted with shower, WC, basin with mirror. The living room and the ground floor bedroom have a direct access to the sunny patio with 8 sun lounges, quality garden wooden furniture with 6 seats – tea table, 2 benches with 2 seats each and 2 comfortable armchairs – which make the place perfect for a morning coffee or an afternoon cocktail. The kidney-shape pool with children section will entice you to dip in the cooling water after having sunbaths all daylong. Notes: Villa Lilly is fully air-conditioned. Satellite TV available in the living room area. A small safe and house security system available. Internet access available. Parking space for 3 - 4 cars available in the yard. Swimming pool dimensions: 8 m in length, 5 m in width and 1,65 m in depth. Please, bring your own beach or pool towels. Changeover day: Flexible according to the current availability. ***This villa is rented by Bgrentals.com and managed by PropertyCare. Eco-friendly villa: Although the enviromental concerns in Bulgaria are not developed at the required level, Villa Lilly has been designed and built as an "Eco-friendly accommodation", because owners love and respect the local area. With this project they give their small contribution to preserving the local resources.What is making Lilly an Eco-friendly property? The villa has 7 solar panels in the yard, which provide the heating of the water tank in the villa. All garden lights are set with an energy saving bulbs. The house has a heat insulation, which is keeping the villa airy enough and helps the guests use the cooling airconditioners only at the very hot summer days. Additionally the WC-s in the house have a half-flushing button to save the water consumption. Because it is more environmentally efficient to dry clothes outside in the summer rather than using an electric dryer, in the villa are provided a clothes line and clothes pins. The green policy of the villa encourages guests to use the washing mashine and the dishwasher only at full capacity, taking shower, instead of bath, air-conditioners to be swiched off, when guests are not at the villa and shutting the tap when brushing teeth or shaving. Choosing Villa Lilly for your vacation and keeping the green policy of the villa, you are contributing to a greener world. Balchik (about 12 000 population) is a charming town, located 47 km north of Varna city. It is like an amphitheatre on the very seashore. The Royal Palace, the Botanical garden, the churches, the Museum of History together with many other attractions make Balchik one of the most visited resorts on the Black sea coast. The Balchik port played an important role in the town's development, being the third sea-side port in terms of significance after the ones in Varna and Burgas. The unique nature and the ancient history make the today's romantic charm of Balchik - a constant source of inspiration for artists, poets and artists. The Royal Palace and the Botanical garden in Balchik. The official name of the palace was the Quiet Nest Palace. It was constructed between 1926 and 1937, during the Romanian rule of the region, for the needs of Queen Maria of Romania. Attracted by the beauty and the romanticism of the seaside town, inspired by the centuries-old trees, the wild flowers and the bird species in the region, Queen Maria of Romania selected Balchik to build her summer residence.The palace complex consists of a number of residential villas, a smoking hall, a wine cellar, a power station, a monastery, a holy spring, a chapel and many other buildings, as well as most notably a park that is today a state-run botanical garden. In 1955 the Balchik Botanical Garden was established at the place of the palace's park. It has an area of 65,000 m² and accommodates 2000 plant species. One of the garden's main attractions is the collection of large-sized cactus species arranged outdoors on 1000 m². Kaliakra cape is the longest cape on the Bulgarian coast. The picturesque cape is located about 30 km north from Balchik. Kaliakra cape stretches 2 km deep into the sea and consists of 60-70 m high limestone rocks, the inaccessibility of which has been the main reason for the construction of an ancient fortress named Tirisis there. According to local tradition forty girls, the sole survivors of a Turkish attack, tied their long plaits of hair together and jumped to their deaths, rather than be raped by the victors. Nowadays Kaliakra is a nature reserve, where dolphins, shags and a numbers of typical steppe birds can be observed, it is one of the very good birdwatching sites in Bulgaria. Kavarna town is one of the relatively bigger towns along the Black Sea coast with its population of a bit over 12 200. On the high hill of Chirakman, which is 3 km away from Kavarna, still can be seen remains of Roman fortresses and medieval town. Kavarna, recognised today as the Rock capital of Bulgaria with so many concerts of world famous bands and artists like Apocalyptica, Deep Purple, Saxxon, Ronnie James Dio, Scorpions, Accept, Destruction, Gamma Rey and Victory, turns into an attractive place for a holiday, combining the modern comfort with a unique atmosphere, at the same time preserving its tranquility and charm. Durankulak and Shabla lakes - The Durankulak lake was declared a protected area in 1983 as part of the measures for the preservation of endangered species. It is also where one of the two major birth migration routes passes – the so-called “Via Pontika”. Near the lakes of Shabla and Durankulak there are law-protected damp areas of international importance. These territories are the most significant winter quarters in Europe for many water birds. The Shabla Lake is one of the biggest habitats of teh White Water Lily and Yellow Water Lily in Bulgaria. The lakes give shelter also to the Otter, which is a rare animal species in Europe.